Eastern equine encephalitis (EEE) is an uncommon but serious disease caused by the EEE virus. EEE is an arbovirus (short for arthropod-borne, meaning spread by insects). The virus can be transmitted by infected mosquitoes to horses, other animals, and, in rare cases people. 1. Eliminate standing water and other mosquito breeding locations. In warm weather, mosquitoes can breed in any puddle that lasts more than 4 days! Remove old tires from your property. Dispose of tin cans, plastic containers, ceramic pots, or other containers. Don't overlook containers that have become overgrown by aquatic vegetation. Drill holes in the bottom of recycling containers that are left outside. Make sure roof gutters are clean and draining properly. Clean and chlorinate swimming pools and hot tubs. If not in use, keep empty and covered and keep covers free of standing water. Aerate garden ponds or stock them with fish. Turn over wheelbarrows and change water in birdbaths at least twice weekly. Turn over plastic wading pools when not in use. 2. Be aware of where mosquitoes live and breed and keep them from entering your home. Mosquitoes lay their eggs in standing water. Weeds, tall grass, and bushes provide an outdoor home for the adult Culex pipiens mosquito (the common northern house mosquito), which is most commonly associated with West Nile virus. Mosquitoes can enter homes through unscreened windows or doors, or broken screens. Make sure that doors and windows have tight-fitting screens. Repair or replace all screens in your home that have tears or holes. Resting mosquitoes can often be flushed from indoor resting sites by using sweeping motions under beds, behind bedside tables etc. and once in flight, exterminated prior to sleeping at night. 3. Protect yourself from mosquito bites. If outside during evening, nighttime, and dawn hours when mosquitoes are most active and likely to bite, children and adults should wear protective clothing such as long pants, long-sleeved shirts, and socks. Consider the use of an effective insect repellent, such as one containing DEET. Repellent containing 30% or less DEET (N,N-diethyl-methyl-meta-toluamide) are recommended for use by children and adults. Use DEET according to the manufacturer's directions. Children should not apply DEET to themselves. Repellents that contain Picaridin or oil of lemon eucalyptus have also been determined to be effective. 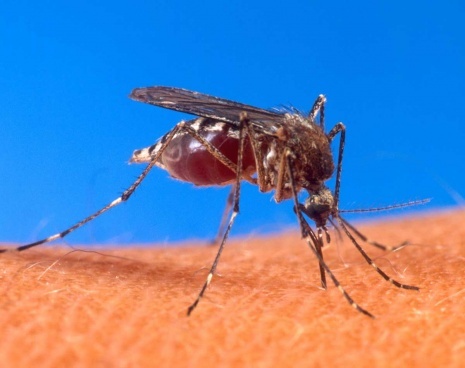 Vitamin B, ultrasonic devices, incense, and bug zappers have not been shown to be effective in preventing mosquito bites.